Energy from the sun (solar energy) is used in two different types of solar energy systems. Solar thermal systems (including solar water heaters) use the sun’s energy to heat water for residential use (up to 160°F); industrial use, including air conditioning (170-350°F); or electricity generation (350-2000°F). 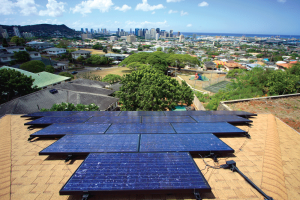 Tens of thousands of solar water heaters are in use in Hawaii. There is one solar thermal electricity production facility at the Natural Energy Laboratory of Hawaii Authority (NELHA) in Kona, Hawaii. Photovoltaic systems do not have the moving parts or steam production found in most other electricity generation systems. Instead, the sunlight shines on the solar cell and causes an electric current to be generated directly. 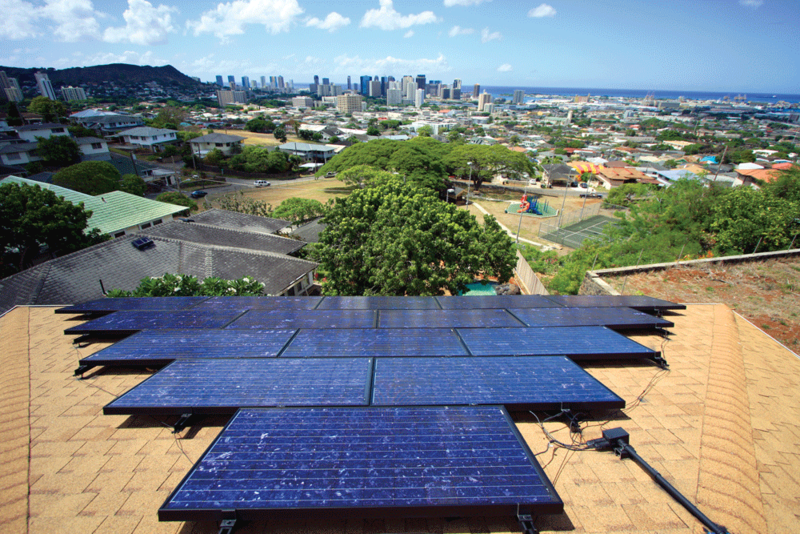 Thousands of photovoltaic systems are in use in Hawaii. Some generate power for use on-site (on residential, commercial, and other buildings); other (larger) systems generate power that is provided directly to electric utilities.